The book of Ezekiel functions as a sort of vacation journal, overflowing with stories of strange dreams, visions, experiences, and creatures! Proceeding today’s passage, Ezekiel shares several famous visions, the 1st of a wheel in the middle of a wheel, another of strange four faced/ four winged beast! It was Ezekiel, of who was touched by the hand of God as he voyaged to a valley full of dry bones, and then in today’s reading, Ezekiel shares with us his experience of wading out into the strange flowing waters streaming from a desert Temple; wading deeper and deeper until they were overhead. That’s a point to note from the get go… before we go with Ezekiel into the water, lets look at where the water was coming from and where they flowed. “I saw water coming out from under the threshold of the temple!” exclaimed Ezekiel, who had actually passed this spot several times without seeing anything. What would he have seen? Water inexplicably dripping from a stone temple in the middle of a dry desert. But there was… and the water was flowing out from beneath the south door. Biblically speaking, water is symbolic of life, (“living waters” we call them) and they provide refreshment and symbolize the Spirit of God. Water is what we use in baptism in the church and what we hydrate with in a race… and as earlier with the children, who doesn’t feel better after a refreshing plunge into a pool or beach? (One of those lessons learned years back was that the water from the sinks of Mexico was living with bacteria, these waters today are living with the spirit of God. So why is this water special? Ezekiel’s stream flowed out from under a closed temple threshold (a door;) living waters cannot and should not be contained, kept inside church walls! Take note that these “living waters” didn’t just trickle out and dissolve, but they got deeper! The further the waters flowed from the temple, the deeper the stream got! This stands in opposition to popular church thought, we like to think that in this room on Sunday mornings we have all the depth, but in a room such as this, with so much uncontainable energy and passion and faith, I am confident that we as a group carry the stream with us as we walk out the doors. I don’t know about you, but I always need a vacation after coming home from vacation… and these past two day’s back in the USA anticipating being here with everyone, I realized that our Church is just that, a weekly vacation; a place where we can gain wisdom, form powerful relationships, and recharge our spirits so that we can again enter the world around us. So, what if instead of the refreshing waters of this space of solace, community, and worship getting shallower as they flow to work and through the Monday’s and Thursdays, and such; they actually continued to get deeper as we embodied the spirit and lessons of Sunday morning in our flow? The first thing that we said 4 months ago starting out was that YOU/WE are the church and this is but a building… without all of you in it, this building risks being a pretty shallow place. Your stories and personalities, visions and passions, your presence and faith is what adds the depth, and when you walk out those doors, we are called to continue wading deeper in our faith. 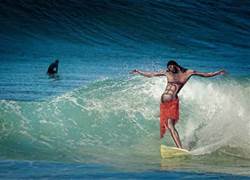 So back to the (slightly altered) story as related to my week of Mexican revelation… Walking from the temple, like an ancient Babylonian Surf bum, Ezekiel “paddled” out. Last Weds, I stood on the shoreline, fresh off an airplane, for my first look at a Todos Santos wave. Looking out, the waves were big enough to make me question whether I actually remembered how to ride a surfboard, but regardless, I knew I had to wade out into the ocean. The waves didn’t look that big from the shoreline… I’m sure Ezekiel, standing in the ankle deep waters by the temple, would never have thought that the waters that lie in-front of him got any deeper… he was after all in the desert! Ezekiel counted in Cubit’s as he was lead outward (we don’t actually know what the exact conversion of a cubit is in feet… but in Mexico they measure waves in feet overhead- and with 2500 years between us, we both braved the waters, Ezekiel was measuring the waters below while I measured the waters above). Ezekiel measured off another thousand cubits and found himself in waist-deep waters. Logically, waist deep is the half-way point; you’re half-way in, but you’re also half-way out! In the sport of surfing, halfway is the worst of places… you’re too far out to be sheltered by the shore and too far in to escape the breaking of the waves. If you get caught half-way for too long, your going to end up exhausted because you are constantly fighting something. I got caught half-out this trip and ended up with so much water in my nose that I literally dripped pacific ocean on the airplane ride back to the states! Halfway is about being “kinda” there, “kinda” Christian, “kinda” not… it is where commitment phobic folks like myself usually feel drawn to! One of the reasons that it took so long for Sweaty Sheep to start up a Sunday service was that I feared committing to Sunday mornings. Ezekiel continued out into the waters, until they were overhead, left solely for the swimmers. On that first day I eventually got the board out past the crashing waves to a place where I could rest my arms and look in awe at the shoreline. This is the other trap in our religious journeys… the point when we think we have made it to our destination. We are coming to church every Sunday, we read our Bibles, we know the lingo, and we are out in the deep waters… Ezekiel spent some time in the deep end and its easy to grow complacent, having gotten through the crashing waves, having waded through the flowing river. Many people live their lives here… in a way its synonymous with being half-way, but at the same time, it is the antithesis. Half-faith is exhausting because there is no rest, we carrying all of our own stresses, doubts, and burdens; but standing at the brink of the deep waters enjoying the view, clear of the dangers of the crashing waves is risk growing complacent… Sweaty Sheep was started with the understanding that its not enough to worship God… to get complacent in the scenery… but we are called to experience God! So the sun was just starting to set and I could have happily spent the first day of my vacation sitting on the surfboard watching in awe, relishing in the beauty of God’s art, but in the distance there was a wave. It looked pretty ride-able and I was moderately confident I remembered how to work the fiberglass plank I was bobbing on; so a-paddling I went. I gave it everything I had, paddled and paddled, until I felt the pull of the waters start to take over (this is an interesting sensation that I can’t quite put to words, but have a feeling you know what I mean.) What had started in the distance as a pretty ride-able “mediocre size” wave, quickly developed into a pretty darn intimidating, “make you pee in your wetsuit,” wall of water though! There is a point surfing where you have a choice; to say a prayer, jump to your feet, and drop in to the strange bluish/green tunnel; or throw your weight back and let the wave pass under you. As I peered at the way painful looking drop, I chose the latter. This happened 3 more times… I just couldn’t get myself to take the plunge! Paddle paddle paddle, bail… paddle paddle paddle, bail. After those three embarrassing attempts, the sun had almost set and I knew that if I went to bed that night having succumb to the fear of dropping in, of going deep, of taking a risk and committing to the ride, that I would never in the week ahead overcome it. Much like a wave rushing towards the shoreline, our fears and doubts have the ability to grow to great heights when we give in to them. That’s when I spotted one more good set coming in, perfectly lit by all the crazy red’s and oranges of the setting sun. It was eerily perfect (like one of those motivational posters that people hang up in their offices but never find in person.) This was going to be it, the temperature, the scenery, the Latino surfer girl who had at some point paddled out to my left was all perfect… there was even a whale that kept breeching a couple hundred yards off a rock. God had aligned everything for this moment… right? I was going to paddle in and have the ride of my life! So I did, Paddle, Paddle, Paddle… the wave started to take over, and I grabbed the rails of the board, jumped to my feet, and steered hard right into a perfect Gringo sized tunnel… This was going to be epic! But looking down, the front of the board was a little under water and going deeper. I remember very little of what followed; the many ungraceful somersaults, the feeling of not knowing up, down or sideways… I don’t remember the sand but the lump on my head and the amount of beach left in my boardshorts convinced me that we had been introduced… It was truely epic alright… The essence of a wipeout!!! I’m not going to B/S you all and say that plunging into your faith is going to be easy, purely joyous, that it will always bear the beauty of a Pacific sunset glistening off a Mexican beach… No, It’s going to beat the living poop out of you on occasion… You’re going to wipe out and summersault. You’ll doubt and cry and on occasion come out bruised and beaten! God wants us to be immersed in his spirit and immersed in His Word, to wade in the water until it is over our heads! And you know, that’s what true Christianity is; it’s over our heads! We can’t figure it out: it’s over our heads! It’s beyond our understanding. Many people stumble in their Christian walk because they spend too much time trying to figure it out instead of letting go and letting God work… those are the ones that never drop in on the wave, they never dive into the overhead river of Ezekiel… those are the ones that never LIVE! Yeah, you’ll wipeout, but how beautiful an experience that is! (they did write a song about it) And when you do catch that perfect wave, your in for an experience that is going to leave you breathless, speechless, and truly committed. I did end up catching a couple good waves this past week, but honestly it was that first wipeout that was the most meaningful! I urge you to reread the Ezekiel text in full this week, see Ezekiel swam, and when he arose from the waters, he was no longer surrounded by the dust of the desert, but a plush wildlife of fruit and flowers with fish fast to swim at his feet. It takes diving into the unknown, but when you allow yourself to be immersed in God, diving naked into the sea, the world becomes a beautiful place, fed by living waters, and deeper by the day. Swim on my faithful friends… and soak up the R&R that is Sunday morning.